Jennifer Fulton at The Inquiring Quilter! Jennifer met her challenge head on last month, and not only gave it her best try, she knocked it out of the park! Visit her original post, and her wrap up above. The Inquiring Quilter was selected from a random drawing to win this bundle of my hand dyed fabrics for spring. A bundle of eight fat eighths will be on its way to her studio this week. Are you ready to join in the #BraveQuilter link up? I encourage you to be a #BraveQuilter, and set one goal to work on something that is challenging to you. Figure out zippers? Learn to piece a Y-seam? Enter your work in a show? Applique something--anything? Dye fabrics?Work with repurposed fabrics? Make a block with curved piecing? Paint with acrylics on fabric? Take a class on something totally new to you? Make buttonholes? 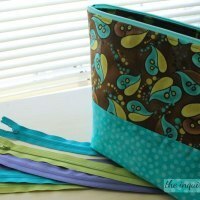 Host a sewing day? Etc. Set a goal to try ONE thing. Pick just one new thing on your list you choose to try this month, and link it up here. Write a blog post or add it to a blog post this week, or simply post it on Instagram. It doesn't have to be a big thing. 1. Add something like *this below to a blog post. 2. Add a link somewhere in your post back to Pink Doxies. 3. Link up that post here. * "I would like to try curved piecing. I'm participating in the Pink Doxies new link up, #BraveQuilter. As part of the link party for March, my goal is to try making one 12" block with curved piecing." Instagram could be a simple picture of your materials or an example of what you'd like to achieve, and say the same thing as above. 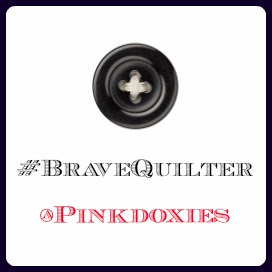 Use the hashtag #BraveQuilter, and tag me @PINKDOXIES. Then DO it! Try it. If you wind up making something fabulous, cheers to you! If you try it, and maybe it's just so-so, cheers to you, too, because you still worked at it. Maybe someone else will have words of advice to help you out. These do not have to be finished projects. We are taking small steps together to become better quilter, sewists, artists. We are celebrating the learning process. The link party will stay open for one week. April is now OPEN, and will close March 10, 2016 at midnight EST. When you've completed your own challenge, write and publish a blog post or Instagram post. The link up for finished projects will be May 1-3. I will draw one winner to receive a bundle of vibrant, hand dyed fabrics from the Pink Doxies Studio. You must link up both at the beginning and end of the month to be eligible for prizes. I missed March as well. I think I will write up a post tonight. Maybe Tish will try something in the 3D and not 2D? I, too, missed March. But I just linked up for April!! I think this is a great idea. Thanks for hosting. Yeah me! Thank you Julie for hosting this. Truly, your challenge was all I needed to just try! Can't say I'm in love with zippers, but I've already decide to make a few more things with zippers to keep the momentum going. And it's all thanks to you! Well, I missed this April, but I think I have my challenge all picked out for next month. Actually, the timing works better that way too, as I'll have time to clear the decks to concentrate on stretching next month!